That the waters of Ghajn Tuffieha are crystal clear goes without saying – but on a calm day in the early morning they are nothing less than divine with good opportunities for some snorkelling along the rocky arms of the bay. Malta’s clear seas are undoubtedly one of its major draws in the summer, with both locals and visitors thronging to the beaches to escape the heat. Although the coastline of the island is nearly 200km long there are surprisingly few sandy beaches and these are mostly found in the north of the island. Though not much visited in the colder months they tend to fill up quickly in the summer. 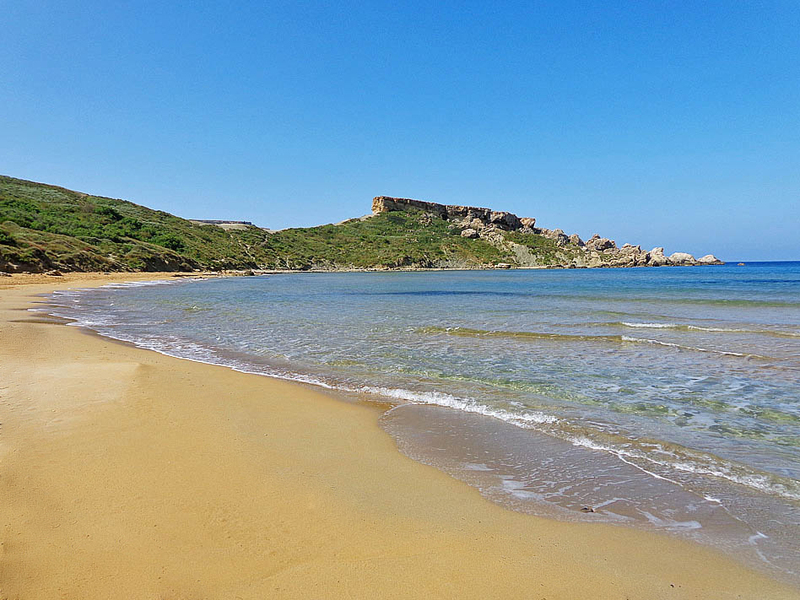 Malta’s largest sandy beach Ghadira, just north of the town of Mellieha is by far the most popular. It is nearly a kilometre long, has warm, shallow water which seems to go on forever and is backed by white sand which makes the water incredibly inviting. A wealth of beachside facilities completes the recipe for a crowd-puller. All in all a highly recommended beach – more so if you are on holiday with young children. But far more beautiful is the beach at Ghajn Tuffieha, next door to the popular Golden Sands Bay. Ghajn Tuffieha is not a large beach with just 250 meter strip of sand, but what it lacks in size it certainly makes up with the outstanding setting. 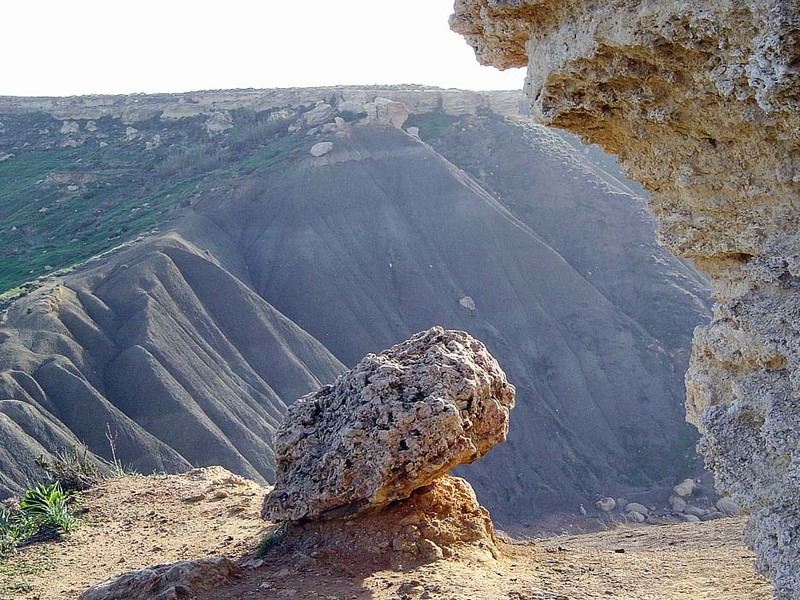 The reddish sands of Ghajn Tuffieha (literally the apple’s spring) are backed by a high clay slope planted with tamarisk and other trees; the trees in turn backed by a cliff further up. That the waters of Ghajn Tuffieha are crystal clear goes without saying – but on a calm day in the early morning they are nothing less than divine with good opportunities for some snorkelling along the rocky arms of the bay. Amenities are limited, but the sole beachside bar can provide refreshments as well as umbrellas and sun beds. The north arm of the bay has a Knights era watchtower precariously poised at the edge of the cliff - and the somewhat undignified ruin of one of Malta’s earliest hotels, foolishly constructed on the clay slope, and practically the only blot in this otherwise pristine landscape. At the bay’s southern end there is a high flat-topped promontory jutting out into the water, dividing Ghajn Tuffieha from the next bay further south, Gnejna Bay. The easily defensible hilltop is the classic Bronze Age village site – this one, known locally as Il-Karraba, being probably the most dramatic of several such sites scattered around the islands. There is nothing to see in the way of visible remains but a sunset walk up the clay slopes below the hilltop gives one an idea of the site’s commanding position as well as spectacular views towards Gnejna and beyond. Needless to say a slice of heaven like Ghajn Tuffieha comes with a price tag; in this case being that at the end of the visit one has to trudge up the long flight of stairs to reach the road…a total of some 188 steps which can take their toll after a day of sea and sun. Trust me – it’s a price worth paying. Ghajn Tuffieha Bay is well served by public transport. Route no 44 gets you there from Valletta, route 225 from Sliema and routes 101 and 102 from Cirkewwa and Mellieha. There is also a direct service from Bugibba, route 223. The bay is not recommended for swimming in strong westerly winds due to treacherous currents when a red flag is normally put up.